With Williams’ first serve suddenly on hiatus, Azarenka was gifted the first game on a double fault. This was just the third time Williams had dropped serve in two weeks. Courtesy of a rash of miscues from Williams, Azarenka extended her lead to 2-0. Later at 2-1, Azarenka double faulted to hand Williams a break point. However, with Williams tallying up the mistakes, Azarenka guarded serve for 3-1. Next, in the fifth, Williams dumped a backhand stroke into the net to donate a fourth break point. Azarenka converted when Williams misfired on a forehand pass. With a 5-1 advantage, Azarenka ultimately pocketed the second set to send the ladies’ final into a decisive set for the first time since 1995 when Steffi Graff and Monica Seles collided. With a 12-0 mark in three set matches this year, momentum rested in Azarenka’s camp. After two break point opportunities went unclaimed by Williams, a confident Azarenka maintained serve and swiftly broke for 2-1. But, Williams clawed back with a forehand up the line winner to obtain her first break since the initial set. Promptly with another hold, Williams had a 3-2 edge. Yet, at 3 all, Williams’ serve again went on a walkabout. Following three successive errors, she stared at triple break point. When a forehand up the line landed long, Azarenka had the break for 4-3. Arantxa Sanchez-Vicario was the last person to triumph after losing the opening set in 1994 at the U.S. Open. Last year, Williams was upstaged by Stosur. This final appeared to be heading toward a similar conclusion as Azarenka overcame break point to move ahead 5-3. After battling her way to 4-5, Williams provoked a bevy of mistakes from Azarenka to have triple break point. When the Belarusian sent a forehand into the net, Williams was back in the match. By cutting down on her mistakes, Williams held and put her nose in front 6-5. 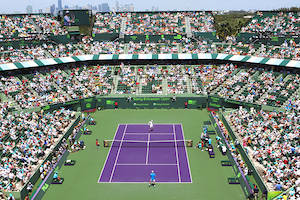 In the next game, with a sensational backhand volley winner Azarenka was one point from getting to a tiebreaker. But with a backhand winner, Williams forced the score to deuce. With Azarenka failing to convert on a second game point, Williams had match point when her counterpart flubbed a forehand. With Azarenka’s backhand landing long, Williams dropped to the ground, realizing that she made a narrow escape. While it’s painful to have come so close, Azarenka was proud of her performance “at the moment it’s tough. . . Serena deserves to win. . . I am honored to be standing with such a champion. I gave it my all. Stepping out of this court today, I will have no regrets”. Williams knows she is fortunate to have prevailed “I was preparing my runner-up speech. I cannot believe I won”. Two points from defeat, Williams stated that her mindset was “to force another game and make [Victoria] serve it out”. She believes the fact she “never gives up” and knowing that she has “come back before” sustained her in those difficult moments. 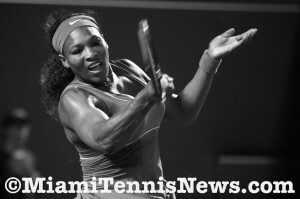 A few days shy of her 31st birthday, Williams is fitter than ever and has her 45th career title. Martina Navratilova was the last player in her third decade to win the U.S. Open in 1987. Now, the possibility of tying Navratilova with 18 majors is certainly within Williams’ grasp.